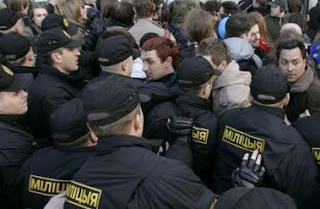 Belarussian police smashed a massive democracy protest yesterday in the last dictatorship of Europe! Charter 97 has extensive coverage of the day’s event. Democracy babes were out in force. Reports of 10,000 to 15,000 protesters attended the massive rally in Minsk. 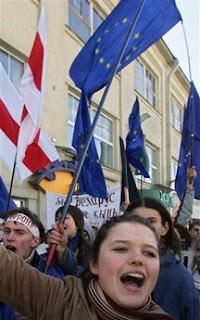 The protesters waved the red and white flags of the 1918 republic, banned by the government which uses the Soviet-era national flag. 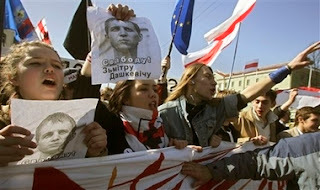 Opposition leader Alexander Milinkevich told the crowd that the free world stood behind their efforts. 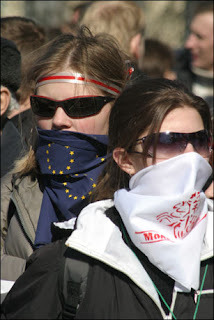 Robert Mayer has a great roundup on the protest.